Once in a while, we meet someone who truly leaves an impression. I met such a person this past Sunday after being invited to a book signing. This was no ordinary book signing, however, because the author is an incredible 12-year old girl!!! Amanda R. Dell’Aringa wrote, illustrated, and published Gertie, A Guinea Pig’s Tail at the tender age of 11 after being inspired by her friend’s two guinea pigs. What started as a “small little story that popped” into her head turned into a beautifully illustrated and professionally published book. Amanda’s mother was impressed with the moral Amanda attached to the story so she encouraged her daughter to bring it to life. Just picking up this book at the bookstore, one cannot guess such a mature message came from such a young mind. 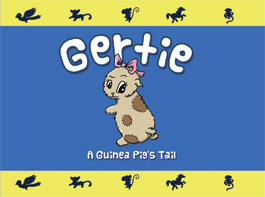 Gertie, A Guinea Pig’s Tail is the story of a young guinea pig who is not too happy with her short, seemingly useless tail. She soon dreams that she’s turned into other tail-equipped animals and discovers what their tails are for. In the end, she learns just how special her own tail is and she contently accepts it for all its squiggly charm. What a wonderful message that all children need to hear! Besides her creativity and discipline in creating this book, what impresses me so much about Amanda is her articulation and poise. She spoke to a crowd of about 35 adults and children, quite eloquently explaining her inspiration for the book, proudly retelling the disciplined process she took on to see her dream through, and impressingly illiustrating how she brought Gertie to life through a drawing demonstration on a whiteboard. Not only did Amanda draw each illustration in the book, she learned how to color each drawing in Adobe Photoshop herself. Amanda said she worked 1 – 2 hours almost every day for a few months. She claims she has trouble finishing projects (which I find hard to believe! ), but with the support of her father (an artist himself) she did it. What an accomplishment for a young, ambitious girl! Amanda is truly an inspiration for young and old alike. I am giving a signed copy of this book to my soon-to-be-born niece; this will certainly provide a role model and inspiration for her. And of course . . . I’m keeping a copy myself. 🙂 Grading Girl gives Gertie, A Guinea Pig’s Tail by Amanda R. Dell’Aringa an A+ for a valuable moral, adorable illustrations (what a cute little stuffed doll Gertie would make! ), and off-the-charts effort. This was an easy one to grade!! → → → Amanda’s book is currently available on Amazon. Click here to order your own copy! While you are at it, please feel free to review Amanda’s book on Amazon – this aspiring author will appreciate your words of support. Amanda’s book is also on sale at Books at Sunset. For a peek at some of Amanda’s other drawings, visit her website at AmandaDraws.blogspot.com. Prepare to be dazzled when you glance through the mythical characters Amanda has created . . . and she’s only just begun! Accomplishing so much by age 12, imagine where she will be later on. This girl is well on her way!! Grading Girl would like to give a shout out to the adorable bookstore holding Amanda’s book signing. I’ve never been to Books at Sunset in Elgin before, but I think I’ll be back. Nestled among a quaint residential neighborhood, Books at Sunset carries an impressive variety of new and gently used books. For much more personal service (think Meg Ryan’s store Shop around the Corner in You’ve Got Mail), check out this wonderful store that is always hosting a variety of local events as well as children’s activities. Amanda’s book is also on sale at this bookstore! !